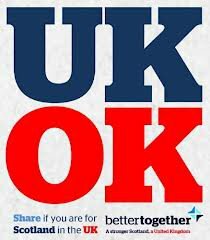 Something seems to be seriously wrong in the pro-union campaign, ‘Better Together’. They may still be ahead in the polls, but the gap has narrowed significantly. Two years of dire warnings about the perils of ‘separatism’ and ‘tearing Scotland out the United Kingdom’ have only exposed the threadbare, tetchy character of the pro-union argument so far. In November last year ‘The Economist’ declared the referendum won for the union; now it reflects on the ‘teflon’ qualities of Scottish nationalism, and the incessant ‘pessimism’ of the pro-union side. Beyond George Robertson’s dire warnings of ‘cataclysmic’ geo-political consequences and ‘the forces of darkness’ a sea change is happening in Scotland which will have an impact long after the referendum. First, look at the careless language pro-union senior figures use. Margaret Curran dismissed Alex Salmond’s major conference speech at the weekend as ‘drivel’. Alistair Darling has form as well. Less than an hour after the Scottish Government White Paper on independence was released he was dismissing it as ‘a work of fiction’, hardly the tone becoming a former statesman. Second, the ‘Better Together’ forces do not want this debate. They are fighting a battle which they would prefer not to, at a time not of their choosing, and when their political opponents are mobilised and galvinised. This fundamental cuts through everything that ‘Better Together’ does; behind their rhetoric they are running a defensive political contest and one of retreat. They are presiding over a virtual, rather than real political campaign: mostly without foot soldiers, made up of three party leaderships, parts of the mainstream media, and business organisations and corporate CEOs. Third, there is a profound lack of respect for the SNP in the pro-union side of differing degrees, running from near-hatred in parts of Labour to a more nuanced opposition in Lib Dems, and with the Tories somewhere in-between. At its worst in Labour, there is a churlish, resentful view that the Nationalists are a party of deceit and deception, about whom not a single good word can be said. Take George Robertson in ‘Scottish Review’. In a February piece this year he admonished the Nats for daring to claim that under independence ‘We will always get the government we vote for’. He pointed out that a mere 45.4% of those who voted supported the SNP in 2011 on a 50.4% turnout, thus showing that 55% of those voting ‘did not want an SNP Government but they got it, divisive referendum and all’. It was sad stuff, niggling over small detail - oblivious to Labour winning three election landslides under Blair on minority votes, or that Scottish Labour for all its Westminster seats has never won a majority of the vote. Fourth, there is the problem with the cybernats who Labour complain about at length. Cybernat excesses should be condemned, but there are issues with how criticism is often framed. Alistair Darling has made numerous interventions against the cybernats to the point it sounds much like special pleading. This should be beneath Darling as leader of ‘Better Together’ and instead be left to his lieutenants. There is also the mirroring of language between cybernats and some senior pro-union figures - the difference being that the former are activists and the latter once influential statesmen. Robertson for one has lambasted cybernats for their aggressive language and for representing the politics of ‘the cesspit’, failing to note how one-dimensional and dismissive of opponents his language often is. Fifth, ‘Better Together’ are failing to keep their own zealots under control - because they have swallowed their own narrative that Scotland is a land terrorised by cybernat gangs. This reflects something deeper and long-term: the abject failure of responsibility at the heart of the pro-union campaign. Johann Lamont has commented of the SNP that ‘It wasn’t my party which walked through the lobbies to create a Tory Government under Margaret Thatcher … and Scotland will never forgive them’; Margaret Curran asked ‘what has devolution ever done for Easterhouse?’ These comments and many more indicate that Labour seems to see all the inadequacies of modern Scotland as at root cause the fault of the Nats. Thus ignoring that Labour was the dominant party of Scotland for fifty years, or that some of the party’s anti-devolutionists (Johann Lamont and Brian Wilson being two) campaigned against their party’s 1979 devolution plans, contributing to the fall of the then Labour Government. What, if any, is the solution to the predicament of union Scotland? One is to argue for a more emotionally resonant case for the United Kingdom. Maybe something such as billboards proclaiming ‘We Are Family’ (thus invoking the Sister Sledge disco anthem of solidarity and compassion) and icons such as Alex Ferguson personifying this feeling and sense of belonging. Another is for the pro-union campaign to unite behind one coherent devolution offer, a path recommended by ‘The Economist’s’ ‘Bagehot’ column. This would entail a joint Labour-Lib Dem-Tory plan which would face the issue of Tory toxicity, guilt by association, and, as seriously, ask who would such an approach really speak to and appeal to? Missing in such solutions is an understanding of the long-term crisis of unionism. The emotional case would resonate with older voters. But you cannot nurture something you haven’t watered and tended carefully over decades. It could smack of a desperate change of message and play into Salmond’s territory. Similarly, the belief of some devo plan as the answer ignores that all such proposals have a Westminster veto and would not deal with the economic and social inequalities of the UK. Finally, it would change the nature of the vote to one which could disadvantage the union side: altering the terms of debate from Yes having to make the case for change to who can best provide change. One recurring theme in the above, seldom commented upon at any length, is the particular ill-ease of Labour unionism. This is a party and tradition which has consistently associated unionism with Toryism and the idea of British nationalism with right-wing reactionary views. Historically, it stood, it argues, not for unionism, but for socialism or a social democratic United Kingdom. Labour has always in the past seen the union as a means to an end, not an end in itself. The end in question was the clarion call of socialism, social justice and greater equality. With the UK further removed than ever before from this state of affairs, after 30 years of post-war Labour Governments, the party has become trapped in the logic of the union as an end in itself. Hence the empty rhetoric of ‘we are Better Together’ and ‘the best of both worlds’: abstract statements of faith with very little link to the realities of present day Britain. For years the union case in Scotland was a given. It was something which just went unsaid as it was part of the fabric of the nation, uncontested by elites, institutional opinion and most of public opinion. That all began to change from the mid-1960s onwards but union Scotland did not adjust to the new realities emerging, and instead sought a series of incoherent compromises based on retreat under challenge from Scottish nationalism and home rule support. The consequences of this are obvious for all to see. Where it leads was explored a decade ago in a study by Iain McLean and Alistair McMillan who stated that the demise of ‘a gut, instinctual unionism’ binding the UK together might not matter in the immediate, but it would become a telling factor when crises and tensions emerged in the future, leading to the eventual breakup of the union. We have not yet reached this point. But the laborious, convoluted campaign of ‘Better Together’ is both a manifestation of this crisis, and aiding and abetting it contributing to the slow weakening and fragmenting of the union. The same is true of George Robertson’s unwitting interventions, embodying a political outlook and tradition that does not like being challenged or to have to explain itself, but which is in a state of long-term decline. It isn’t beyond the bounds of possibilities that a new kind of unionism could emerge post-September, but will require a new generation of politicians and very different pro-union parties. Until then, we are faced with a campaign dominated by two nationalisms, one modern, progressive, ‘Big Tent’, happy to win over converts and recognise non-nationalist voices (Scottish), the other, harking back to the past, nervous of how to speak to unsure Scotland, wishing this debate was over and wasn’t happening (British). When will the British nationalism of ‘Better Together’ wake up and realise that it is a nationalism, and one which seems shaped by entitlement culture and Scotland’s and Britain’s establishment feeling aggrieved at having to explain themselves? Slowly and visibly they are losing the Scotland they profess to care about so much, and in the process preventing the discussion moving on to the non-nationalist terrain of the kind of Scotland we aspire to and want to live in. It is not an edifying or attractive picture, but does anyone senior in the pro-union camp have any idea of the predicament that they have created, and how to constructively change it?